Free breakfast and Wi-Fi a year-round pool and a pet-friendly attitude are highlights of a stay at the Red Roof Inn Tupelo. Within the two-story Red Roof Inn Tupelo's 96 rooms guests discover handy features like coffeemakers microwaves mini-fridges flat-panel TVs and desks. Free Wi-Fi and in-house business services are available and breakfast is also free every day. While on the road guests can keep up with their cardio workout in the fitness room. There's also a year-round outdoor pool for kicking back. The hotel provides parking and allows pets both compliments of the house. 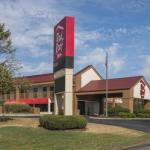 Located less than one mile east of Natchez Trace Parkway the Red Roof Inn places guests less than three miles north of the cafes in downtown Tupelo. Within four miles enjoy an outing at the Tupelo Buffalo Park & Zoo or discover the history of the King of Rock 'n Roll at the Elvis Presley Birthplace. The hotel is also three miles from the Tupelo National Battlefield and the North Mississippi Medical Center. Tupelo Regional Airport is four miles west of the hotel.